Link to Wisdom’s player page at The Cardinal Nation, with additional biography and history information. Message board community (41): After appearing in four straight community rankings from 2013-2016, Wisdom dropped out of the voting all together this time last year. That was on the heels of a rough 2016 season, during which he carried a 79 wRC+ (.677 OPS) at Triple-A Memphis. This year, Wisdom, and his 31 home runs, put him back on the map as the 41st prospect ranked in the community ballot. Bw52 put him on the board first at #35. Derek Shore (40): Shortly after his prospect status faded last winter, Wisdom re-entered prospect consideration through a career-year in his second trial at Triple-A Memphis. The 26-year old’s sixth professional season was full of career bests, including his highest batting average (.243), slugging percentage (.507), and on-base plus slugging percentage (.817) over a full season. He also blew way past his previous career highs with 31 home runs and 89 RBI. “He did a nice job of driving the ball,” Memphis manager Stubby Clapp said. “When he got his pitch, he didn’t miss it for the most part. He was important in clutch situations. Being able to drive in some RBIs, especially during the playoffs. After being limited to only 78 games at Triple-A in 2016 due to surgery on his hamate bone, this season was perhaps Wisdom’s most defining of his career – and it all started in spring training. Wisdom carried the momentum from the spring throughout the 2017 season and became The Cardinal Nation’s Memphis Player of the Year by season’s end. The reason for the third baseman’s success has indeed been a simpler approach at the plate, not thinking about previous at-bats or the pitcher he is facing. His biggest flaw as a prospect has and will always be his strikeout percentage. Even after his terrific season, Wisdom’s strikeout rate of 29.4% raises concern, especially since it shows little improvement from his career 31.9% punchout percentage. Budaska preached to Wisdom that he had a solid two-strike approach, but wasn’t utilizing it. The hitting coach told Wisdom the swing he uses to do that should be his two-strike swing. “He’s so strong, once he stays compact and short like that and barrels it up, it can go anywhere,” Budaska said. From a scouting perspective, one scout likes Wisdom as a prospect and thinks he has value, depending if a team gives him an everyday shot to play. Another scout doesn’t believe he is a sure thing but could play regularly. With a good enough glove and playable power at the hot corner, Wisdom will likely struggle against right-handed pitching and projects to be a platoon type in the big leagues. Before being passed over as a September call-up, Wisdom spent half the month of September helping the Redbirds win their first Pacific Coast League title since 2009. Looking ahead, there is no telling if he will remain in the organization by next spring (Rule 5 eligible). Assuming he’s not taken in the Rule 5 draft in December, Wisdom will look to fight for a job in the majors come March with the Cardinals. Brian Walton (42): Again, the three voters place Wisdom in the same vicinity in the top 50 rankings, in the low 40’s. That is not a great area for a Triple-A player in the second half of his 20’s age-wise, even one who was named to the All-Pacific Coast League squad. Those for whom there are high expectations would have already risen to the top, rather than struggling for recognition entirely. To that point, in this, Wisdom’s sixth year to qualify for this list, he rejoins the ranks after not placing in the top 50 in 2017. For the record, his slow decline began with two years ranked in the teens, followed by two more in the 20’s overall in the Cardinals system. 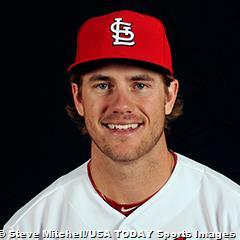 The starkest comparison for Wisdom is a fellow California college star third baseman who was St. Louis’ pick before him, as both were selected in the supplemental first round of the 2012 First-Year Player Draft. That other Cardinal is Stephen Piscotty, who was taken at 36th overall, with Wisdom following at #52. While Wisdom is still trying to make his MLB debut after six years of efforts, Piscotty underwent a position change and has already logged over 1,300 big-league plate appearances through three seasons. Further, Piscotty earned a long-term contract, while Wisdom has not yet made the 40-man roster. Speaking of the latter, for me, the handwriting was on the wall when Wisdom was not among the Cardinals farm hands who were promoted to St. Louis this past September. While Wisdom has one more year before being able to declare minor league free agency, he will be eligible to be taken in the upcoming Rule 5 Draft. The question is then, what kind of team would value Wisdom the most? As we already know, along with Wisdom’s considerable power comes with a price – a high strikeout rate and low batting average. Though his third base defense is good, utilizing his skills in an American League environment might be his best possible fit. Even then, remember that simply being selected in the Rule 5 is much, much easier than actually sticking on a big league roster for an entire season. Also working against him is the trend across the game for larger bullpens, meaning fewer bench spots for marginal position players. It seems clear the Cardinals do not see Wisdom’s fit as a third baseman, at least for them. Further, those who criticize the club for not trading him are being unrealistic. Other teams knew it was likely he would be available for the taking in the Rule 5 Draft, so why allocate resources ahead of time to acquire him? After all, how unique are his feats, really? Many players are hitting more balls out of stadiums at an alarming rate all across baseball, diminishing the differentiation of Wisdom’s one standout tool – his power. Specifically, eight Triple-A players launched at least 30 round-trippers this season, including faded prospects like Bryce Brentz and Richie Shaffer. The Cardinals kept another 30-homer hitter in Tyler O’Neill, who is almost four years younger than Wisdom. If Wisdom is taken in Rule 5 and returned to St. Louis, or is not taken at all, he seems slotted to return as Memphis’ third baseman, perhaps backed up by Aledmys Diaz. If the current organizational personnel remain in place, it would take a run of injuries to others for Wisdom to have a realistic chance to the make the Cardinals out of spring training. Among those with third base capabilities ahead of him are Matt Carpenter, Jedd Gyorko, Greg Garcia, Diaz and Paul DeJong. As indicated above, Wisdom receives a Scouting Grade of “4 medium”. The numeric score reflects a potential future ceiling as an impact bench player, with “medium” suggesting some additional work remains ahead for him to achieve it. Specifically, it should begin with cutting the strikeouts from his 29.4 percent mark in 2017 and turning around his consistently under eight percent walk rate. At this point, however, there is little reason to believe significant changes are ahead, despite periodic exclamations that his potential had been unlocked by this coach or that. However, if Wisdom remains in the organization for another go-round, it is not unreasonable to anticipate that injuries will open up an opportunity for him with St. Louis at some point during the long season ahead. After all, despite low expectations having been placed on him, Luke Voit contributed in 2017, so why couldn’t Wisdom in 2018? To see the entire list of top Cardinals prospects and remaining article schedule, click here. This includes the top 50 countdown and 10 in-depth, follow-up articles. Most of them are exclusively for members of The Cardinal Nation. If you are not a member, join today so you do not miss out!